It happens. A recipe calls for simply the yolks of the eggs, and has listed no alternative use for the whites. I know, you probably pour the whites in Tupperware, expecting to use them in the near future. But, you forget, and they are forever discarded. Instead of casting them away to die as leftovers in your fridge, toss them in your mixing bowl immediately, and turn that baby on. 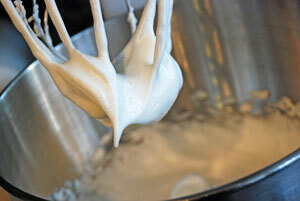 With the whisk attachment, beat the egg whites on low-medium speed until foamy. Add 1/4 teaspoon of cream of tartar and continue to beat the whites until they hold soft peaks. Once the meringue is perky, and the whites have soft peaks, gradually add 1/4 cup (50 grams) of granulated white sugar for every egg white. Add it slowly, so the cookies won’t taste gritty. Continue to mix for few more minutes. 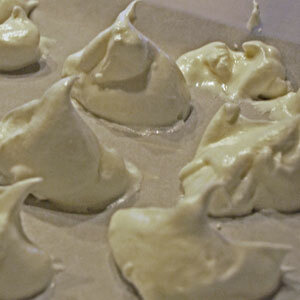 Drop the meringue by spoonfuls onto the baking sheet. Let them cool for dessert tonight, or put them in an air-tight container for tomorrow night. I’ll have to make these for my MIL. She’d love them.